Joyce has written two books about wealth preservation and provided source material for other publications. Entrepreneurs are inherently optimistic people. But the very optimism that contributes to their success may torpedo the subsequent preservation of their fortune. 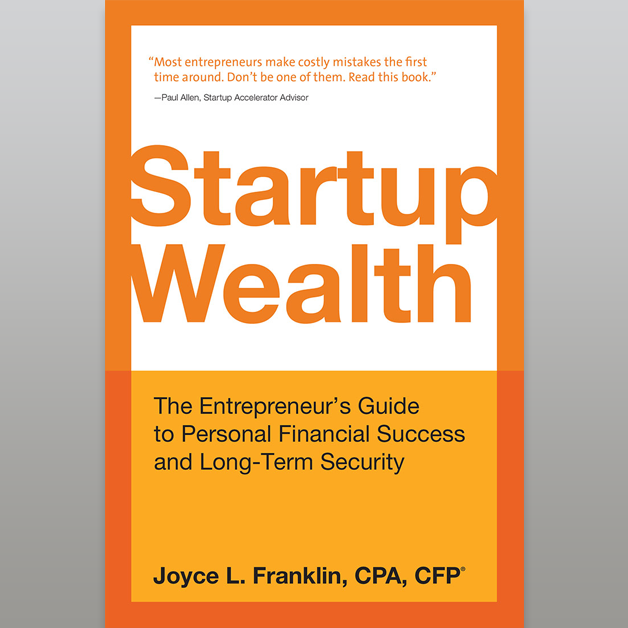 Startup Wealth is a crucial guide for entrepreneurs looking to understand the personal financial and legal challenges of creating and building a company. An exploration of the Entrepreneur’s Wheel of Life and comprehensive discussions of equity awards, stock options, and angel investing will help you and your employees maximize personal wealth from day one until well after your IPO or acquisition. The water coolers and watering holes of Silicon Valley are rife with tales of paper millionaires who didn’t diversify, spent money they didn’t actually have, and wound up with nothing. Life, Liquidity & the Pursuit of Happiness is a crucial guidebook for startup employees looking to understand and prepare for the personal financial and legal challenges that can arise before, during, and after an IPO, acquisition, or other liquidity event. Dozens of anecdotes—along with equity award and stock option guidance, financial planning tips, and checklists—will help you and your team maximize wealth. Steven Schoenfeld, John Wiley & Sons, Inc.
For over three decades, indexing has become increasingly accepted by both institutional and individual investors. Index benchmarks and investment products that track them have been a driving force in the transformation of investment strategy from art to science. Yet investors’ understanding of the sophistication of this burgeoning field has lagged the growing use of index products. Active Index Investing is the definitive guide to how indexes are constructed, how index-based portfolios are managed, and how the world’s most sophisticated investors use index-based strategies to enhance performance, reduce costs and minimize the risks of investing. Expert advice can help you safely navigate the personal financial challenges of an IPO or liquidity event. Joyce Franklin’s white paper “Preserving the Wealth of Successful High-Tech Community Members” is packed with expert advice for executives, founders, and others in the high-tech community. Learn how to make smart financial decisions before, during, and after your company experiences an IPO or other liquidity event. Based, in part, on personal stories shared during interviews with more than 30 successful tech executives, this paper clearly explains the challenges, choices, and tradeoffs people face as part of a rapidly growing company. The Four Phases of Startup Life™ graphic clearly charts the financial and quality of life paths tech executives and employees experience in a startup. 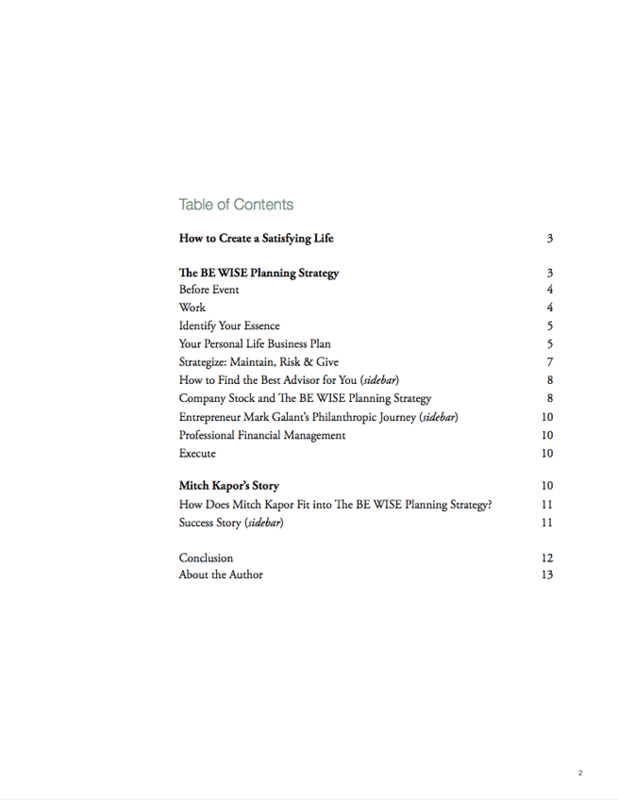 “The BE WISE Planning Strategy: A Formula for Financial Success and Personal Happiness” explores the five-step process for planning for life before and after a wealth event. The steps are simple: Before Event, Work, Identify, Strategize, and Execute. 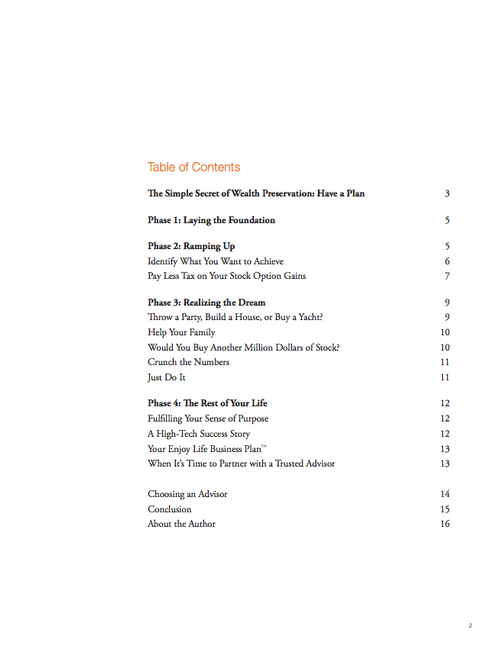 After reading this paper, you’ll know how to strategize your future based on your goals and assets. If you have excess capital, divide it into three categories: the “Maintain Bucket” for what you need to comfortably live out your life, the “Risk Bucket” for angel investing or starting a new company, and the “Give Bucket” for making donations to your favorite causes. 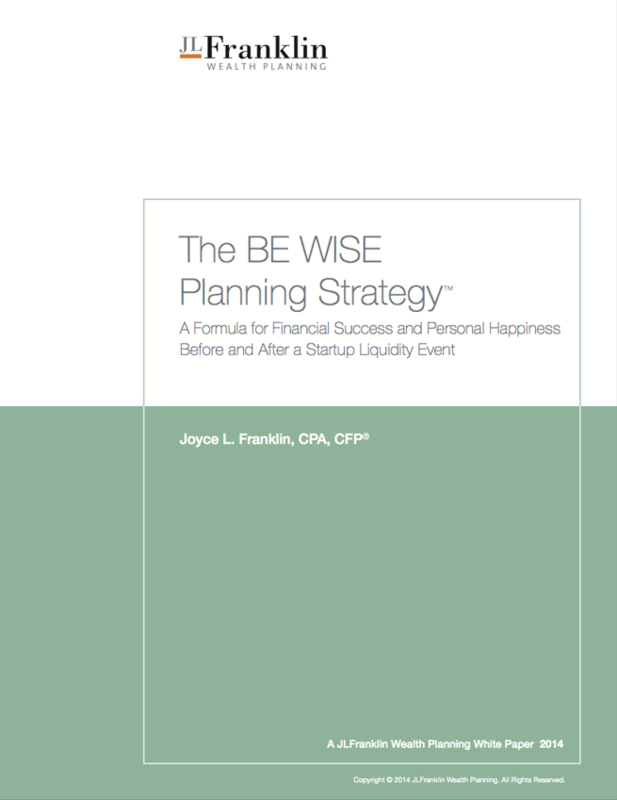 The BE WISE Planning Strategy™ graphic depicts the process of discovering your passions and planning for life before, during and after an IPO, merger, or acquisition in five steps: Before Event, Work, Identify, Strategize, and Execute.